Dec. 19 (Bloomberg) — When about 500 voters packed into a New Hampshire town hall last week to hear Ron Paul speak, they saved their biggest applause for something no other Republican presidential candidate is talking about. “I would like to restore your right to drink raw milk anytime you like!” Paul said to loud and sustained cheers in the historic Peterborough Town House. 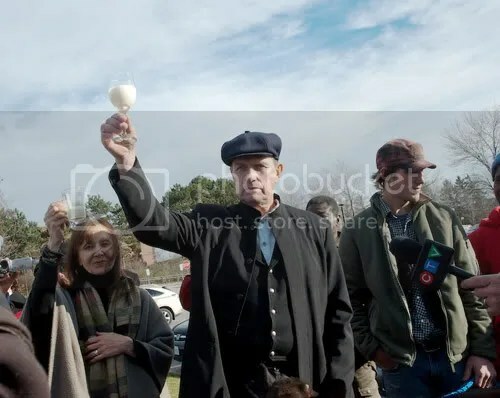 Tagged as New Hampshire, politics, raw milk, Ron Paul, U.S.
Michael Schmidt raises a toast following his sentencing last month in Newmarket. “The lawyer representing Durham-area farmer Michael Schmidt will be arguing for leave to appeal his conviction and sentence of raw milk sales and distribution on April 25, 2012.